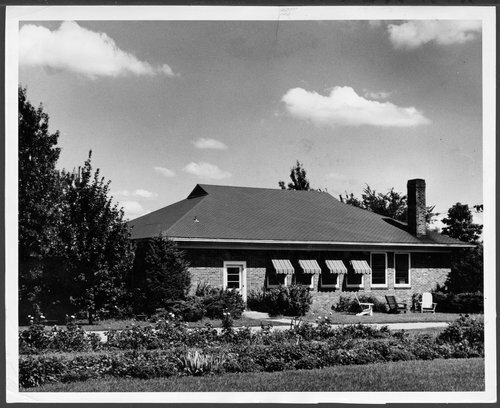 This black and white photograph shows the Keys Manual Arts Shop on the East Campus of the Menninger Clinic in Topeka as it looked during the 1950's. The gift of Mrs. Lucy Stearns McLaughlin, it was opened in 1942 to promote research into the use of occupational therapy techniques in treatment and to train therapists in such techniques. The building was named for the donor's first husband. In 1925, the Menninger Sanitarium Corporation purchased a farmhouse on the west edge of Topeka, Kansas. The farmhouse became the inpatient clinic and the surrounding 20 acres were developed with buildings and gardens to become the "East Campus" of the Menninger Foundation. These photographs document the construction of an important building in the Menninger philosophy of treatment. In 1982, the "West Campus", a much larger area, was developed west of Topeka. In 2003, the Menninger Foundation was moved to Houston, Texas.